This is lovely, comfortable, beachfront accommodation, fully furnished, and traditionally redecorated in sympathy with its age. Feel as though you have stepped back in time. It is nice and cool in the summer, and cosy and warm in the winter. 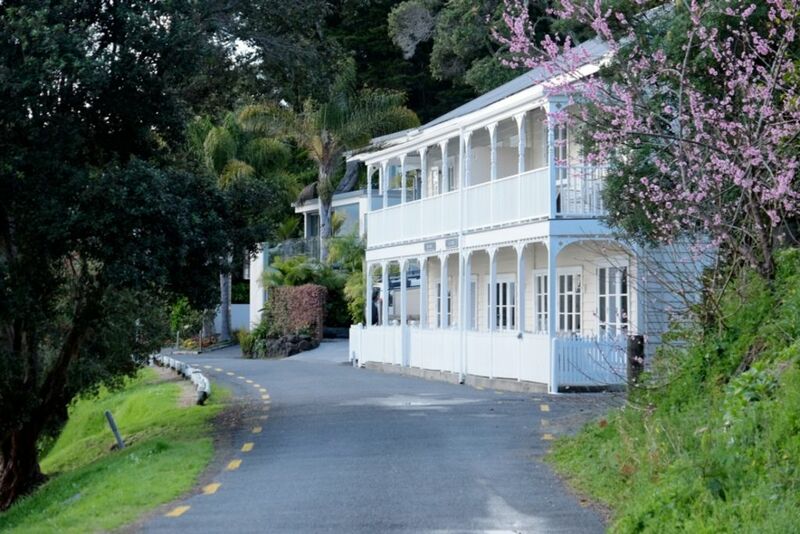 The flat is located right on the beachfront at Opua. Wake up to the sound of sea gulls and stunning views over the Bay. Opua is very quiet, but there is always something happening and something to watch, whether it is the car ferry chugging back and forward across the bay, or yachts and motorboats making their way in and out of the harbour. Sometimes you can be lucky enough to see dolphins or orca. The homestead is only 100 metres to the car ferry and general store and another 100 metres to the marina and cafe. By road, it is 5 kilometres to Paihia or Russell. It is right at the beginning of the coastal walkway from Opua to Paihia. Other lovely walks are only a short distance away. There is also a cycleway from Opua to Taumarere Station. It is simply the best place for a relaxing, rejuvenating holiday or weekend and a perfect location from which to explore the stunning Bay of islands and the Far North. Please note - there is another apartment upstairs in the building that sleeps 6 people. Please see the separate listing. As it is a historic building there is no smoking anywhere on the property, inside or out. There is also a ban on any naked flame (i.e. lighted candles). Please note. At present (December 2018) a neighbouring apartment has just started a major renovation which is expected to take a few months. The caretakers are doing their very best to minimise any disruptions and work will only be happening between hours of 8:00 AM and 5:00 PM, however quiet enjoyment at this time cannot be guaranteed. Please make inquiry first to get a first hand update of the status of the renovation. Mother and Grandmother living in Taranaki, New Zealand. Interests are family, travel and photography. Although I put the year purchased as 1885, this obviously is not when I purchased the property, but when my great grandparents moved the building to its current location at Opua. It was then run by my great-grandmother, then my grandmother after that as a boarding house. In 1967 my uncles divided the property into five separate apartments, three of which I now own. My hope is that my children too will keep this property, maintain and value it as I do. I love the history, especially the family history attached to this old homestead and the Opua area. 10 metres from the beach and water Has a small road between building and water. This road services about 12 homes. Outside parking for 1 vehicle Any other vehicles must be parked on the street a little further along the road. Very close to marina, general store, yacht club, cycleway and walkway. Lovely view over the Bay. Although we had a short stay it was very pleasant. The accommodation was excellent and there were lots of little touches that were great. Very tastefully appointed accommodation. Our family thoroughly enjoyed our brief stay at the Opua Holiday Flats. We highly recommend this place to everyone who wants to enjoy magical Opua. Our happy place!!!! Lovely house, neat, tidy & everything there we needed. The view was spectacular viewing of both sunrise & sunset. A minor setback was the renovations happening in adjoining flats but the builders were very respectful. Reasonably priced accommodation in a quiet location with amazing views. Good amenities. There was no wifi password in the house. Luckily Lynda was always at hand to help out with our queries. Things like wifi and instructions for TV etc should all be available in the house. A powerpoint in the bathroom would be helpful. Overall we enjoyed our stay in this top location. Beautiful property, beautiful area and lovely hosts who went out of their way to accommodate us! Overall we enjoyed our visit but wished for furniture in the lounge that was a little more comfortable. Thank you to our host Lyn who was wonderful, friendly and very supportive. Opua is a great area! Unfortunately the owner forgot to tell us there were building works going on upstairs and in the next door apartment. The noise was unbearable and there was mess all around the outside. It would not be fair for me to judge the property on this basis as the area is lovely and in other circumstances we would surely have enjoyed ourselves for the month we booked. In fairness I was refunded and luckily found alternative accommodation nearby in Russell. Excellent cottage with all amenities, good size kitchen and spacious living room. We really enjoyed the breakfast on the terrace with the sunrise views!! the road in front of the cottage is a cul-de-sac with no exit and hence barely any traffic and not an issue what-so-ever. Opua is a good base for exploring the Bay of Islands and far north. The Twin Coast cycle way starts or finishes at Opua and Horeke on the west coast. Lots of water activities, boating, fishing, kayaking, deep sea fishing, etc. Most of these are based in Paihia which is 5 kilometres by road. There is a lovely coastal walkway from Opua to Paihia which takes about 1 1/2 hours to walk.